This article is about the village in Luxembourg. For other uses, see Schengen. Schengen (Luxembourgish pronunciation: [ˈʃeŋən]) is a small wine-making town and commune in far south-eastern Luxembourg, on the western bank of the river Moselle. The commune border includes the tripoint where the borders of Germany, France, and Luxembourg meet. Other villages within the commune include Remerschen and Wintrange. After the mergers with Burmerange and Wellenstein in 2011, the commune has a population of 4,223 with an area of 31.42 square kilometres (12.13 sq mi). The largest settlement within the commune of Schengen is Remerschen after which the commune used to be named. The name of the commune was changed in 2006 to take advantage of the Schengen's name recognition after the signing of the Schengen Agreement there in 1985. Schengen Castle dates from 1390 but was almost completely rebuilt in the 19th century. It is now a hotel and conference centre. Ceremonial marker near the tri-point of France, Germany and Luxembourg. The European Museum was opened on 13 June 2010, 25 years after the signing of the Schengen Treaty, in the Centre européen building. The permanent, trilingual exhibition on the history and significance of the Schengen Agreements, on 200 m2 (2,200 sq ft) of exhibition space, shows visitors the elimination of the control of persons at the internal borders, put into practice as one of the four foundational European freedoms in the 1957 Treaty of Rome. The signing of the Agreement is documented with historic photos and video and sound footage as well as statements by those involved at the time. ^ "Fusion des communes de Burmerange, Schengen et Wellenstein". Legilux. Government of Luxembourg. Retrieved 13 June 2015. ^ "Loi du 24 juillet 2006 portant changement du nom de la commune de Remerschen en celui de Schengen" (PDF). Journal Officiel du Grand-Duché de Luxembourg: 2661. 30 August 2006. Retrieved 27 December 2012. ^ "Das Schloss von Schengen", Schengen a.s.b.l. (in German) Retrieved 27 March 2011. Wikivoyage has a travel guide for Schengen. This Luxembourg location article is a stub. You can help Wikipedia by expanding it. Baarle-Hertog, known as Baerle-Duc in French, is a Flemish municipality of Belgium, much of which consists of a number of small Belgian exclaves in the Netherlands. The Schengen Information System (SIS) is a governmental database maintained by the European Commission. The SIS is used by 31 European countries to find information about individuals and entities for the purposes of national security, border control and law enforcement. A second technical version of this system, SIS II, went live on 9 April 2013. 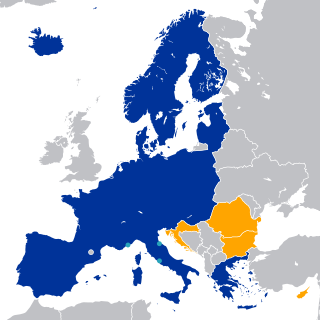 The Schengen Agreement is a treaty which led to the creation of Europe's Schengen Area, in which internal border checks have largely been abolished. It was signed on 14 June 1985, near the town of Schengen, Luxembourg, by five of the ten member states of the then European Economic Community. It proposed measures intended to gradually abolish border checks at the signatories' common borders, including reduced speed vehicle checks which allowed vehicles to cross borders without stopping, allowing residents in border areas freedom to cross borders away from fixed checkpoints, and the harmonisation of visa policies. A tripoint, trijunction, triple point, or tri-border area is a geographical point at which the boundaries of three countries or subnational entities meet. 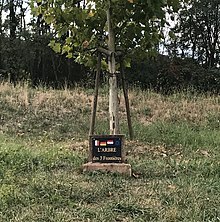 Remerschen is a former commune and small wine-growing town in south-eastern Luxembourg, belonging to the commune of Schengen, near the point where the borders of Germany, France and Luxembourg come together. 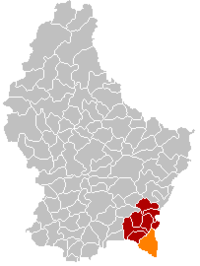 Burmerange is a village in south-eastern Luxembourg. It is part of the canton of Remich, which is part of the district of Grevenmacher. It was a commune until it was merged with Schengen in 2011. Wellenstein is a small town in southeastern Luxembourg. It is part of the canton of Remich, which is part of the district of Grevenmacher. It used to be a commune with its administrative centre at Bech-Kleinmacher, until it was merged with Schengen in 2011. Wintrange is a small town in the commune of Schengen, in southeastern Luxembourg. As of 2008, the town has a population of 402. In 2006, the Commune de Remerschen was renamed Commune de Schengen. The Prüm Convention is a treaty which was signed on 27 May 2005 by Austria, Belgium, France, Germany, Luxembourg, the Netherlands and Spain in the town of Prüm in Germany, and which is open to all members of the European Union, 14 of which are currently parties. The Schengen Area is an area comprising 26 European states that have officially abolished all passport and all other types of border control at their mutual borders. The area mostly functions as a single jurisdiction for international travel purposes, with a common visa policy. The area is named after the 1985 Schengen Agreement. Luxembourg wine is primarily produced in the southeastern part of the Grand Duchy of Luxembourg, with vineyards overlooking the Moselle River. Along this river, which for 42 km makes up part of the border between Luxembourg and Germany, wine is made in three countries. There is a continuous history of winemaking along Moselle and in Luxembourg going back to Ancient Roman times. Wine production in 2006/07 was 123,652 hectoliter from 1,237 hectares of vineyards. Out of total wine exports of 87,776 hectoliter in 2005/06, 71,726 hectoliter or 82% was exported to nearby Belgium. Exports to Germany was the second largest at 8,168 hectoliter, or 9%, and is to a large extent made up of base wine in bulk for the production of blended Sekt rather than being sold bottled with "Luxembourg" anywhere on the label. Therefore, very little Luxembourg wine is seen outside Luxembourg and Belgium. François Valentiny is a Luxembourgish architect. The Treaties of the European Union are a set of international treaties between the European Union (EU) member states which sets out the EU's constitutional basis. They establish the various EU institutions together with their remit, procedures and objectives. The EU can only act within the competences granted to it through these treaties and amendment to the treaties requires the agreement and ratification of every single signatory.